Goulds Pumps 3642 (closed-coupled) and 3742 (frame-mounted) are single stage, end suction, centrifugal pumps for water circulation, booster service, liquid transfer, spraying systems, jockey pump and general service pumping. 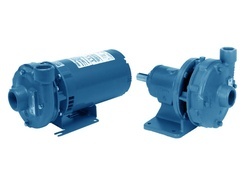 Pumps are available in three different materials of construction: all iron, bronze-fitted and all bronze. Pump impellers are enclosed design for high efficiency, threaded directly on the motor shaft. Close-coupled units have NEMA standard frame motors with C-face mounting and threaded shaft extensions. Frame mounted units can be coupled to motors through a spacer coupling, or belt driven.